Ricotta gnocchi at Luce in Cambridge. Where to: Luce, on the outskirts of Harvard and Porter squares. Why: It’s an interesting revival of a space that’s seen some turnover in recent years. Owner Rene Becker closed his French-esque Shepard several weeks ago. And once upon a time, it was the much-loved, broody and dark Chez Henri. With Luce — named for Becker’s young daughter — he aims to create a neighborhood place where families can stop in for pasta and pizza. Becker, a baker by trade, is the longtime owner of Hi-Rise Bread Company, with two locations in Cambridge. He’s also a former food critic. Presumably, the man knows his stuff. The Back Story: Shepard had growing pains, despite early acclaim. Chef Susan Regis (Upstairs on the Square) left; Cambridge health officials also ordered it to stop using charcoal and wood for cooking, following neighbor complaints. But now here is Luce, with Becker at the helm, and chef Scott Jones (Menton, No. 9 Park) in the kitchen, ready to take over this prime real estate. The dining room is simple: wooden tables, bare walls, a small window into the kitchen in the back. What to Eat: Starters, pizza, pasta, and grilled dishes. Begin with airy fried calamari dusted with Calabrian chili ($16) or fava bean puree, a zingy paste best swiped with Hi-Rise’s rye bread ($11). There are a trio of pizzas: fig and prosciutto, carbonara, and pesto chicken ($18), though Becker is happy to accommodate younger diners with a plain version. Pastas come in whole or half portions, and they range from the familiar to the experimental. 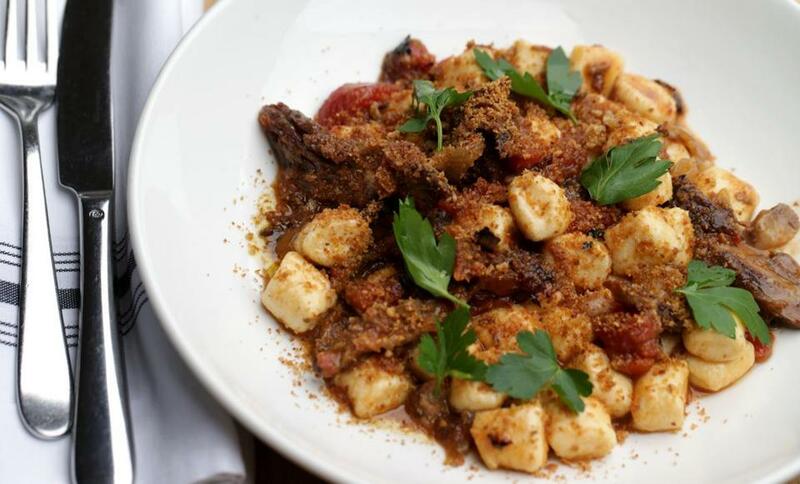 Try nubby bits of ricotta gnocchi ($21/$29) commingled with braised lamb, tomato-onion sugo, and anchovy crumbs or a comforting tagliatelle with beef and pork Bolognese ($19/$28). There are also grilled items: mackerel, oysters, head-on shrimp, broccoli rabe. Can’t decide? Order a $55 multi-course family meal, made up of whatever the chef decides. What to Drink: Becker is an oenophile, and here he focuses on Italian wines, many of which are available by the half bottle. (The wines by the glass list is small, however.) There’s a house Negroni, an Aperol spritz, and Peroni on draft. The Takeaway: A simple, stylish follow-up to a restaurant that was gone before its time, overseen by a pedigreed team — and a fine alternative to the other neighborhood Italian restaurant, Giulia, down the block. Kara Baskin can be reached at kara.baskin@globe.com. Follow her on Twitter @kcbaskin.